Sheila Villarreal receives a check from Mountain Festival Chairman Carl Gehricke, Chamber Chairperson of the Board Stephanie Garcia and Chamber Greeter Chloe the Beagle. "Boots, Buckles & Spurs" is the theme for the 2019 Tehachapi Mountain Festival. Congratulations to Sheila Villarreal, the winner of this year's Mountain Festival Theme Contest. Presenting the check to Villarreal is Mountain Festival Chairman Carl Gehricke, Chamber Chairperson of the Board Stephanie Garcia and Chamber Greeter Chloe the Beagle. Villarreal will be our VIP guest to all events during Mountain Festival, including participation in the parade, tickets to the rodeo and pancake breakfast and official Mountain Festival T-shirts featuring her winning theme. The Mountain Festival theme sets the tone for the entire festival. Once the theme is established, the logo can be designed. Parade floats are planned based on the theme. The official Mountain Festival T-shirts, posters, brochures and all advertising bear the official logo. 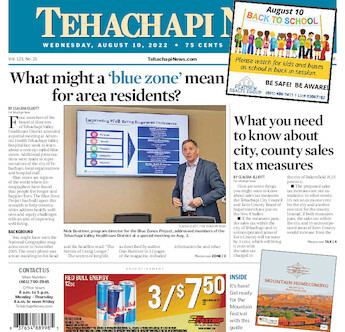 Ida Perkins is president of the Greater Tehachapi Chamber of Commerce.